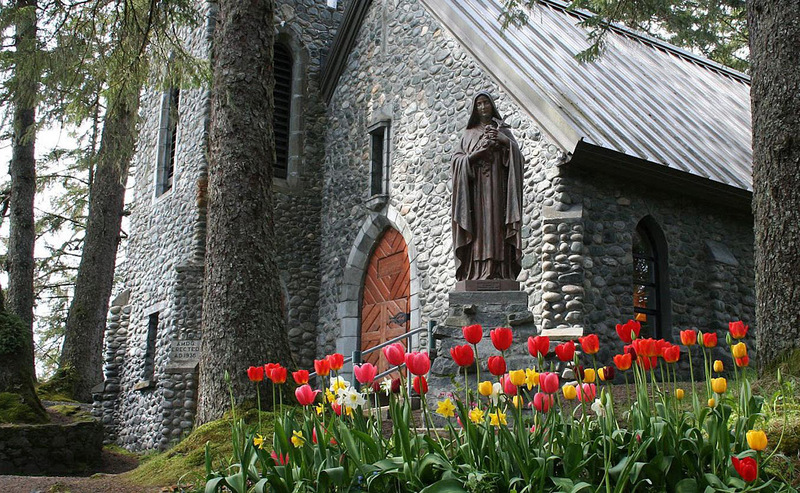 Built in the 1930s, the shrine is dedicated to St. Thérèse of Lisieux, patron saint of Alaska. Earlier that same day, seeking to explore a land of glaciers and mountain forests, we had reached the end of the line. No major roads seemed to connect Juneau with anything. Feeling defeated, we stopped to lunch in the parking lot of a rural mini mart—waiting politely while a three-foot black raven stood on the hood of our rental eating a claw full of french fries. A short time later, about 22 miles “out the road,” as the locals said in those parts, we spotted a small but uplifting road sign. Instantly I hit the brakes and veered abruptly into St. Thérèse’s Alaskan sanctuary. Our visit to the shrine was nothing less than divine. But that was a long time ago. Today, nearly eight years later, St. Thérèse revealed another hidden treasure. She had sent us home with orb photos! Click the pictures to enlarge them. Three orbs are visible in this photo. 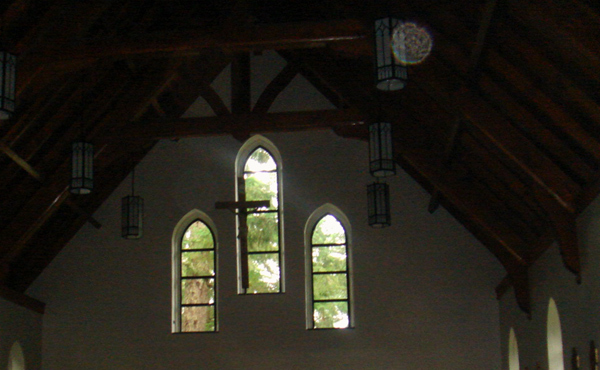 While one orb hovers above the altar, two more may be seen floating up the aisle. 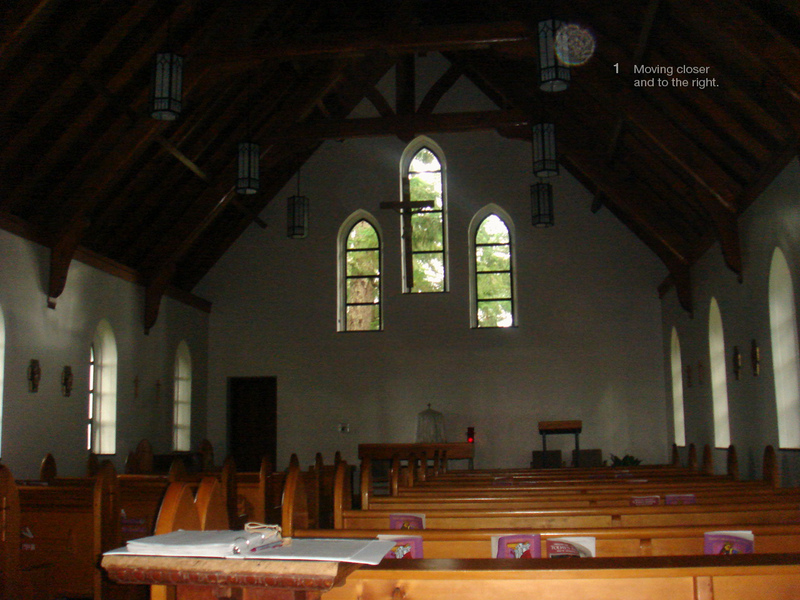 In this orb photo, the entity has crossed to the right side of the chapel and moved closer to our camera. Like our unplanned visit years earlier, the orb photos at Shrine of St. Thérèse were just as miraculous. 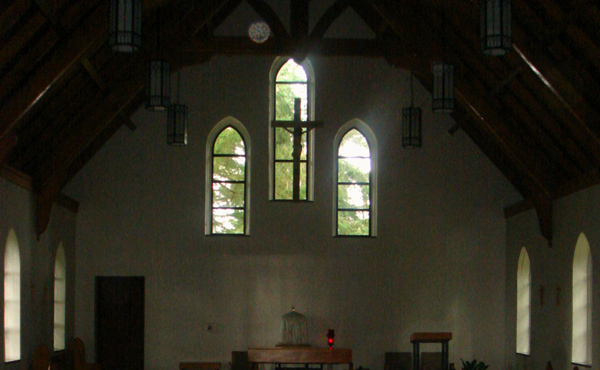 After I emailed a shot of the shrine’s labyrinth to a friend, something led me to look again at the interior photos of the chapel. Back in 2008, I had snapped only two quick pics. A greenish forest light shone through the arched windows, but it was of little use to our pocket camera. 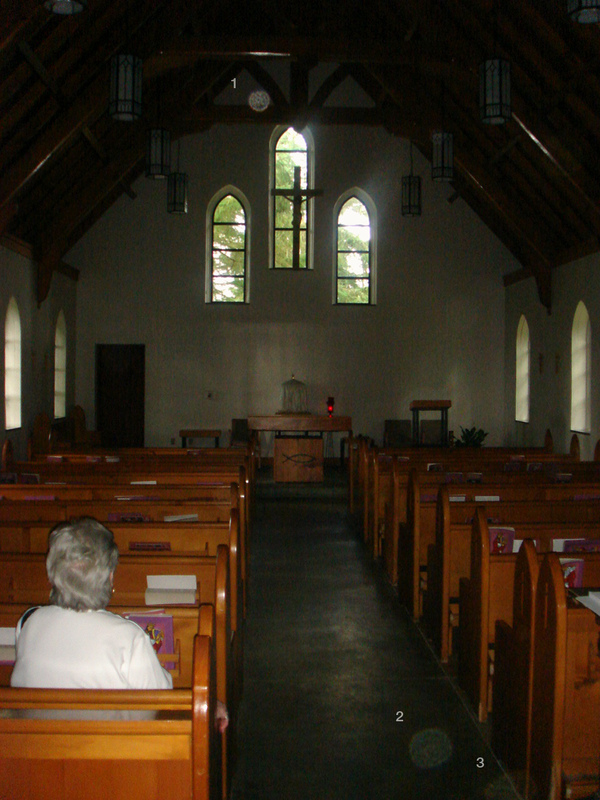 At the same time we did not wish to disturb an elderly woman who sat in silent prayer near the back of the chapel. I’m sure our intrusion didn’t trouble her. Even so, stomping around the chapel nave in hiking boots caused us to feel a trifle out of place. Since orb photos and supernatural phenomena were not on our list that day, we left the quiet seeker to God and her prayers. Three orbs are plainly obvious in our pictures. But I cannot explain why I hadn’t noticed them until now. Although we snapped 800 shots on the Alaskan trip, these are the only orb photos. When combined with the sign of the fish, the cloistered tabernacle, the cross of Christ, and the prayerful woman, these orbs never cease to astonish me. Orb photos taken with Sony Cybershot DSC-S600, 6.0MP. Image enhancements: Sat.+25%; Exp.+135%; Gamma: 95%. Color noise: –71%; Sharpen details: 81%; JPEG artifact removed. I am not an orb fanatic. In truth, my own encounters far exceed this type of phenomena. But through the lens, some of the beings I meet may look like orbs. A few of my former clients are also spiritual energy healers. I’ve studied hundreds of alleged orb photos, fake and perhaps not-so-fake. These poorly lit snapshots from an early model digital camera rank among the best orb photos I’ve seen. 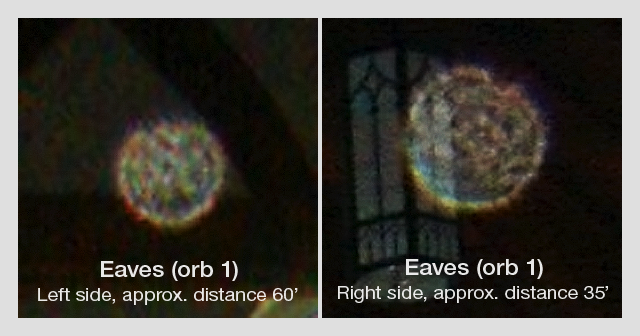 In this case, note the orbs’ jewel-like structure, internal energy force lines, and rainbow color patterns. The orbs are also luminous, meaning, they glow in the dark. What’s more, the orb that floats high in the eves, above the altar, moves around in the scene. These qualities are “proof of authenticity,” according to orb experts. 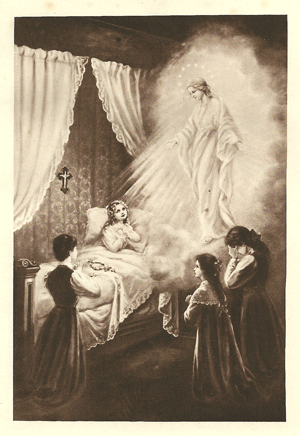 Thérèse Martin, also known as Thérèse of Lisieux, was born in France in 1873. She later became a cloistered nun of the Carmelite Order at the age of 15. She died nine years later, at the age of 24, and was canonized a saint in 1925. Thérèse is known for her “little way.” In her book, titled The Story of a Soul, she writes that what really matters in life is not our great deeds, but our great love. Now, known throughout the world, the message of St. Thérèse teaches us that no one has to earn God’s love. Above all, we must know that God loves us first. The purpose of our lives is to respond to his love. As a labor of love, volunteers of all ages carried stones from the beach to construct the shrine’s beautiful labyrinth. The shrine provides both tourists and seekers an enchanting spiritual adventure. The lush natural setting of Shrine Island is likewise beyond compare. A wooded path encircles the chapel, adorned with fourteen powerful, hand-carved stations of the cross, each set within a pillar of beach stone. While on the mainland, visitors may traverse the Merciful Prayer Labyrinth. Colorful flowers, fauna, and deep spiritual wonders abound for those who think, as I did, that only bad weather, glaciers and hungry polar bears await the arctic tourist. Excluding orb photos, all shrine site photos (and some text) are borrowed from the shrine’s website, Shrineofsainttherese.org. 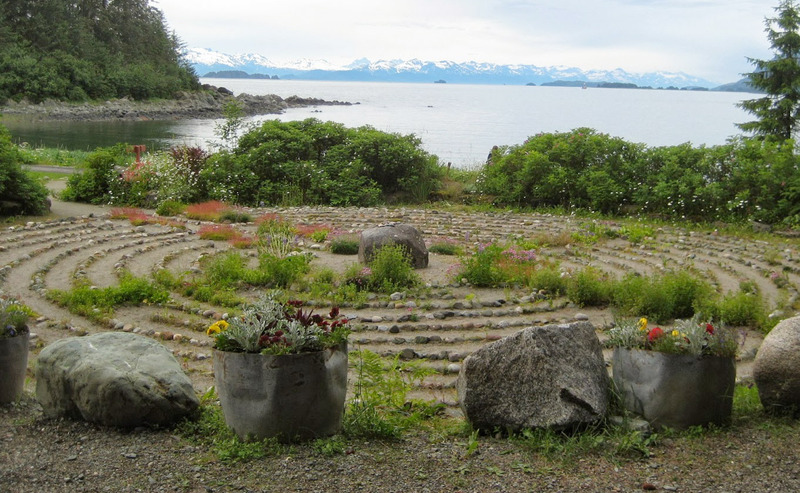 For those interested in a hosting a quiet spiritual retreat, wedding, or for folks who just happen to be headed to Juneau, I insist that you visit this sacred island paradise. While you are there, I am certain that St. Thérèse will grace you with many personalized blessings of love!